Halloween has been giving Super Bowl Sunday a run for its money the past few years when it comes to pizza sales. As parents rush to get kids out the door for trick-or-treating, pizza is a great treat! 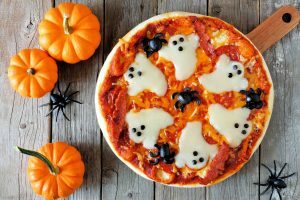 Whether your customers are looking to grab a bite with you or have it delivered, we’ve got some great ideas to help increase your sales on pizza and other favorites this Halloween. Make your location family friendly. Put up some decorations and let employees get in the Halloween spirit. Have a costume contest with employees and let your customers vote on their favorite. Offer candy to customers who dine in and be their first stop on the trick-or-treating route. Halloween is a busy time for parents and partiers alike! Make sure you get the word out in advance that you are happy to bring dinner straight to their door. Be prepared for the influx in deliveries! Create a ghostly pizza with cheese or a spider pizza with olives. Looking for something less cute? Try some firey hot dishes like “ghost” pepper wings or pizza sauce. Offer a kid’s meal for families dining in on Halloween or a party pack with items preselected from your menu that you know travel well for take-out. If you are offering a pizza special, consider a discount for customers that order multiple pizzas. If you serve adult beverages, cook up some crafty cocktails this Halloween! Customers will pay a premium for beverages that put them in the holiday spirit. Get some great ideas like Black Magic Margaritas and JELL-GLOW shots here. We hope these tricks will help you scare up some extra business this Halloween!